The Blueshirt Bulletin website is down for reasons above my pay grade so making a cameo appearance is an old friend. Friday night was a very busy for the New York Ranger prospects with twelve out of thirteen prospects in action. With January almost at an end then the push for playoff positioning is starting to get more intense and we will see which Ranger prospect rises to the top. 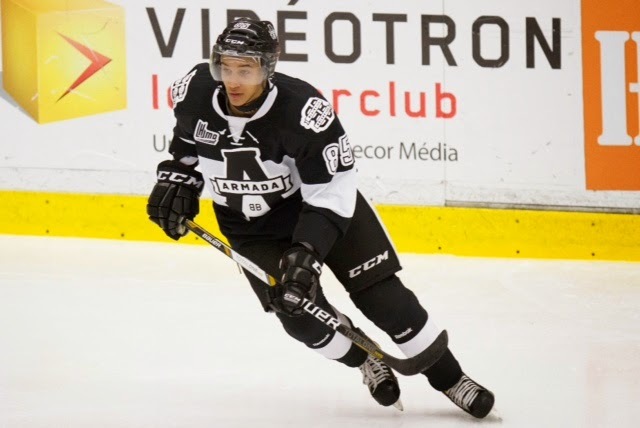 Daniel Walcott (2014 5th) is running away with the most improved prospect tag as the captain of the Blainville-Boisbriand Armada has improved his played at both ends of the ice. Walcott led his Armada up against the team leading the QMJHL the Rimouski Oceanic and the Armada came away with a 6-3 win that was a lot harder than the score shows. Walcott had a 1-1-2 evening on one shot with a +2 and three hits as the Armada jumped out to a 3-0 lead after two periods only to see that lead disappear in a rather strange way. The Oceanic scored three shorthanded goals in a span of 2:28 in the third period to tie the score. Most embarrassing for the Armada had to be giving up two of those goals while the Oceanic only had three players on the ice. The Armada though did not fall apart despite the min-meltdown as they scored three goals to regain the lead and defeat the Oceanic. Walcott registered his fourth goal of the season on a power play in the second period. It was the Armada’s third goal of the game and Walcott’s third power play goal of the season. Walcott would earn a secondary assist on the Armada’s sixth goal as he improves to 4-23-27 on the season. The win helps the Armada move into second overall in the QMJHL and a virtual tie with the Oceanic for the best record in the QMJHL. Not bad for a team that for its first nine games this season. Anthony Duclair (2013 3rd) picked up two assists as his Quebec Remparts had little trouble with the Halifax Mooseheads 6-1. Teammate Ryan Graves (2013 4th) had an assist as well as the Remparts stopped a losing streak. Duclair had both a primary and a secondary assist to improve to 1-5-6 since being returned to the Remparts by the Rangers. Duclair has registered at least a point in five out of the six games since his return. Graves had a primary assist on the Rampart’s sixth and final goal of the game to improve his own numbers to 8-12-20 on the season. The win combined with Rimouski’s loss allows the Remparts to close to within four points of the East Division leader as well as the OMJHL overall leader. Adam Tambellini (2013 3rd) scored his thirtieth goal of the season as his Calgary Hitmen shut out the Swift Current Broncos 7-0. Tambellini scored the Hitmen’s fourth goal of the game, an even strength goal. Tambellini is now 30-23-53 in 46 games. Richard Nejezchleb (2014 5th) had primary assists on his Tri-City Americans first two goals of the game to help them shutout the Seattle Thunderbirds 4-0. The win helps the Americans pull to within one point of Seattle for the seventh playoff spot in the WHL’s Western Conference or even better two points of Spokane for the fifth playoff spot. The new playoff setups will confuse plenty of people before the season is done. Nejezchleb improves his season totals to 13-20-33 but he has to stay in the lineup in order to help Tri-City’s hopes of a good playoff spot. Keegan Iverson (2014 3rd) had a primary assist on his Portland Winterhawks second goal as the Hawks shutout the Spokane Chiefs 4-0. The assist was Iverson’s fourteenth and twentieth overall point. Iverson though was not around when the game ended having taken a misconduct penalty with 4:50 remaining. Brady Skjei (2012 1st) had a secondary assist on his Minnesota Golden Gophers second goal but it was not enough as the Gophers fell to top-ranked Minnesota State 4-2. This season has not even come close to what Skjei and his teammates had hoped for which is leading more and more speculation that Skjei will leave school after this season. His defense is very close to NHL ready as is his skating but his offense is not. Still Skjei right now would still be an upgrade over John Moore and Matt Hunwick. Skjei is 1-5-6 in fifteen games this season as he has also missed six due to injury. Ryan Mantha (2014 4th) had the primary assist on his Niagara IceDogs first goal as the IceDogs spanked the Plymouth Whalers 5-1. For Mantha his assist improves his season totals to 2-7-9 as his IceDogs have not lost in regulation in nine straight games. Even better for the IceDogs is that the team that started the season zero for terrible has now moved into sixth place in the OHL’s playoff standings. It has been a rough week for goalie Brandon Halverson (2014 2nd) as first Thursday he scores a goal into his own net making him the highlight of gaffe plays. On Friday Halverson gets yanked after giving up three goals on thirteen shots but after his replacement gives up two goals on three shots, Halverson goes back in net. Through all this Halverson still winds up with the win as his Sault Ste. Marie Greyhounds somehow manage to defeat the Mississauga Steelheads 7-5 for their seventh straight win. Yes one can laugh about gaffes after the fact and one will credit Halverson for being able to laugh at himself but what is not funny is how misleading Halverson’s seven game winning streak is. Getting yanked in two of those games but getting credited for the win might make the won/loss look good but it is also becoming a concern, Yes Halverson is still a kid at eighteen but when you are the starting goalie on a team that has loaded up to make a run at the OHL championship then now is the time to buckle down and get serious. Halverson maybe 23-3-2 with a 2.89 goals against and a 0.909 save percentage but right now Igor Shestyorkin (2014 4th) has to be seen right now as the more established goalie prospect. One of the teams that Halverson has to help the Greyhounds get past is Troy Donnay’s (2013 UFA) Erie Otters. The Otters boast two prospects that could go in the first five of the 2015 NHL Entry Draft. The Otters have loaded up just like the Greyhounds have and on Friday they were on the road facing the Guelph Storm. Donnay was scoreless as his Otters earned a hard fought 3-2 win for their fifth straight win. The win allows the Otters to remain three points behind the Greyhounds for the top spot in OHL’s Western Conference. Steven Fogarty (2011 3rd) was scoreless on three shots and a +1 as his Notre Dame Fighting Irish lost to the Northeastern Huskies 3-2. Fogarty was 13-8 on his faceoffs bringing his overall season numbers to 220-224.If you think that Fogarty’s numbers are bad because he is below 500 then consider this; Fogarty has taken 133 more faceoffs than the number two center has. When you consider how many faceoffs that Fogarty faces then being only four under 500 is excellent. Tyler Nanne (2014 5th) was scoreless on three shots and a -1 as his Madison Capitols lost to the Bloomington Thunder 5-1. The Capitols fall to 17-11-6 in the USHL’s Eastern Conference. Finally Cristoval Nieves (2014 2nd) missed Michigan’s game with Wisconsin with what was called “Flu-like” symptoms. He might play on Saturday but given the way bugs have been flying around let him sit an extra day rather than help spread it among his teammates. Want to wreck a team’s season? Then unleash any kind of virus in a team’s locker room as the flu bug this season has just wreaked havoc all over hockey. One team Minnesota State had to cancel a game because they could not get enough healthy bodies to face Princeton.